What’s the diving in Phuket like? All year round, there are dive boats around Phuket, most of which are based in the south of the island. From November to May the diving conditions are better due to better and more-predictable weather. From June to October the diving is still good, but the weather and waves can be less pleasant or unpredictable, or both. Water temperatures almost never drop below 26°C, so a 3mm wetsuit is usually adequate. Marine life is varied, healthy and abundant at most dive sites. Where are the Phuket dive sites? Directly south of Phuket Island are the Racha Islands, which have some good dive sites. On the west coast of Phuket, which is where most tourist beaches are, there is not much diving other than some half-day trips on local longtail boats. How long are Phuket diving trips? Most diving from Phuket is done on day trips, which have 2 or 3 dives. These are very popular, but the boats are often very busy. To best enjoy diving around Phuket, joining a short diving cruise enables you to relax and have better diving at the same locations, plus some other dive sites. 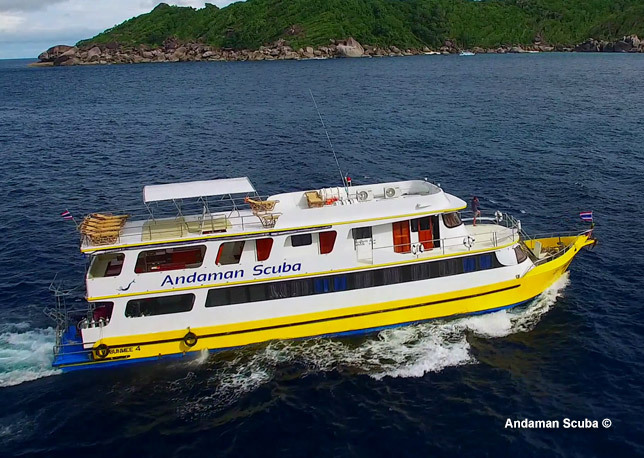 Phuket liveaboard diving trips normally depart from Chalong or Patong. Why is Phuket liveaboard diving better than day trips? Phuket liveaboard diving may look more expensive than day trip diving, but after you calculate the accommodation and 3+ meals per day, and the extra dives, it’s actually excellent value. 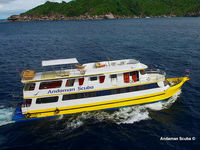 But price isn’t the only reason why diving Phuket from a liveaboard boat is better than joining day trips. Phuket day trips are normally on ‘shared boats.’ These boats are large and some can take 50 divers. The owners of the boats normally can’t find 50 of their own customers every day, and the island has dozens of dive centres - many of whom don’t have boats. Therefore, Phuket day trip diving boats are nearly always full of customers and staff from several companies. Organisation can be bad, especially with all the dive staff trying to get into and out of the water first, either to give their customers the best experience or for other selfish reasons. Phuket liveaboard diving trips are far more relaxed, and rarely full at all. Every diving guest on each trip is part of the same group that joins the trip at the start and continues to the end. Divers do not join late or leave early. Even if some guests are booked by agents, the ‘dive staff team’ on Phuket liveaboard diving boats work as one and do an excellent job. To enjoy the best diving in Phuket, contact us to help you find a short diving cruise.